You start Story mode by picking one of the main factions rather than an individual character as in some previous Dynasty Warriors games. There are five factions in total — the Wu, Wei and Shu kingdoms from the main “Three Kingdoms” period, the Jin faction from the latter days of this era, a loose “Other” faction that explores characters who don’t neatly fit into any of these classifications, and a whole mode just for long-running series mascot and formidable badass Lu Bu. There are two ways you can play Story mode: a stage at a time, or as a continuous, ongoing narrative from start to finish in which finishing one battle immediately takes you to the next. For your first playthrough, it’s a good idea to go for the “continuous” option for the sake of coherence; after that, when you want to revisit stages, the Stage Select option becomes extremely helpful. The reason why you might want to revisit stages is because in each faction’s storyline, there are a number of battles in which completing optional objectives will open up a side mission that you otherwise wouldn’t be able to try. And on top of that, each faction’s story has a critical point a little past the halfway mark, at which it diverges in one of two different directions: one historical, one hypothetical. By default, you will proceed down the historical path; completing all of the optional objectives in prior stages will unlock the hypothetical path, providing a “what if?” scenario if things had unfolded a bit differently. This is an extension of how Dynasty Warriors 4 did things. I’ve just played the Wu storyline through to its “historical” conclusion so far, but it’s already clear how this is going to work: completing optional objectives generally saves major characters from death in one way or another. For example, in one early mission, Sun Jian gets shot by an arrow and eventually dies if you do not complete the side objective; complete this, however, and he will be saved. In another, Sun Ce is cursed by a dark sorcerer (you know, like in history) and eventually dies; completing the side objective in the mission in which this happens unlocks a whole new battle in which you pursue the sorcerer, cut off the source of his sorcery (his sourcery, if you will) and save Sun Ce. In other words, the hypothetical scenarios — or the Wu one, at the very least — look set to ponder what might happen if certain key figures in the overall history of things hadn’t been killed, and if they had been present at decisive turning points in the story of their kingdom. At the time of writing, I haven’t yet reached the “split point”, but I’ve completed a number of the side objectives; they definitely put an interesting twist on many of the missions, and encourage you to play in different ways. Sometimes you need to be quick and anticipate the enemy’s movements; other times you need to be thorough and explore the map to its fullest. I mentioned previously that the Story mode doesn’t work by you simply selecting a character as in earlier games. Instead, what happens is that for each main “episode” of the overall narrative, there are generally three or four main characters to choose from, representing key figures in that particular conflict. The interesting thing here is that how the mission unfolds is actually different according to the character you pick, especially in the case of those battles where success in either the main or side objective is dependent on actually following a strategy laid out for you. 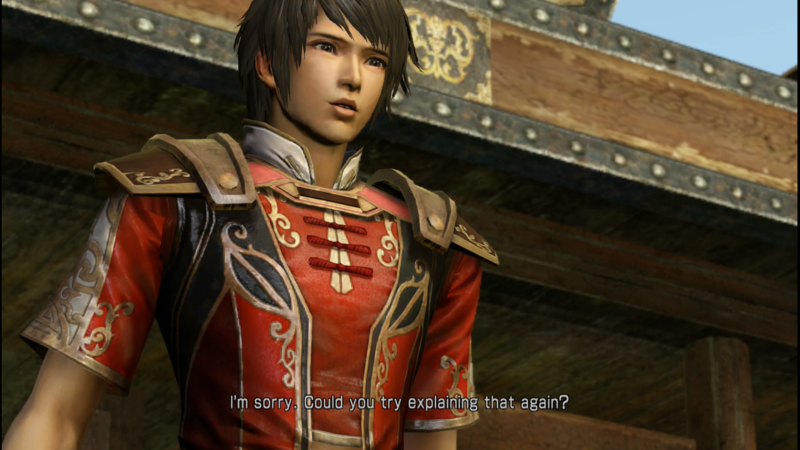 A good example is in the Battle of Nanjun stage of the Wu campaign, in which Zhou Yu is given the role of decoy while Lu Meng and Lu Su are tasked with sneaking into a base via another route while the enemy’s attention is occupied. If you are playing as Zhou Yu, you need to go one way and make some noise to attract the enemy; as either of the other two, you need to go the other way, taking care to be spotted as little as possible, and if you are spotted, to ensure you beat the lookout in question to a bloody pulp as soon as possible. It allows missions to have a different “feel” when you replay them, not only through the different ways that the characters handle, but also through varied objectives. On top of this interesting structure, there’s a very good incentive to play through Story mode before tackling Ambition mode: getting a head start on levelling your characters. Because you don’t stick with a single character in Story mode, the level your playable character is at the end of a mission is “passed” on to the character you pick for the next. 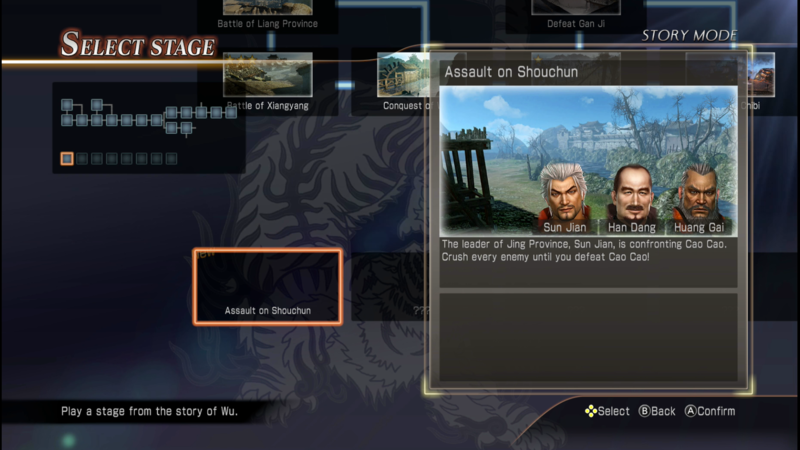 So for example if you complete the first mission of the Wu campaign as Sun Shiangxiang at level 12, then switch to Sun Ce for the second mission, Sun Ce will automatically become level 12, and so on right through the “chain” of characters you play as up until the conclusion of that particular story. For those who prefer to grind, you can reset characters to level 1 — and there’s even incentive to do so through base stat bonuses when resetting from the level cap — but for those of us happy to be provided with a bit of a baseline power level, the Story mode is a sensible place to start that minimises the need for grinding to make characters usable or useful; it also provides plenty of opportunity to gather weapons and skills to get the playable cast kitted out nicely before jumping into Ambition mode.